Antique 19th century Spanish painting. 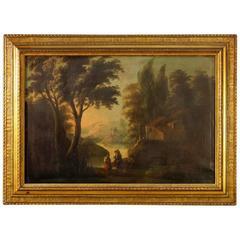 Work oil on canvas depicting bucolic landscape with characters of good pictorial quality. Carved and painted bronze wooden frame with some signs of wear (see photo). Painting signed at the bottom left (see photo), for antique dealers and collectors. Framework that is part of a group of three paintings (see photo and ask for the bulk price, if available). On the right there is a cut in the canvas (see photo), to be restored. Overall in fair state of conservation. Sight size: H 43.5 x W 60.5 cm. On the right there is a cut in the canvas (see photo), to be restored. Overall in fair state of conservation.